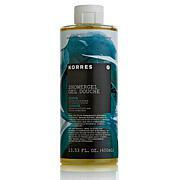 I love the size of this product, but I like all Korres products. I have been using Korres Shower Gel products and their body lotions for about 5 years and have found any that I haven't liked. Thanks HSN. I LOVE THIS AND HAVE ORDERED A LARGER SIZE. I LOVE THE SMELL, AND THE QUALITY IS THE SAME AS THE ONE I BOUGHT PREVIOUSLY (COCONUT). My skin is so much softer and looks better with all Korres products. I usually use the yogourt but ran out of product and bought this sent/size because of availability.It smells good not to over powering,makes skin soft. Thanks for your easy pay.I found a soap that helpes my skin clear up (I'm allergic to many things but this has help my skin alot compared to the reactions other soap gave me).Yes, this is pricey but thanks to easy pay i can afford it when i can. Just give it a try and return if not ur thing but i think once u try you'll be a member for life.